The information provided in this section pertains to H-1B work visas. Of course, you may not understand all of it, but our New Jersey immigration law firm is here to help. After you have read through this practice section, you may have questions. We are available and look forward to hearing from you. When a company wishes to hire an alien for a temporary position or a temporary period of time (maximum 6 years), and the position involves a “specialty occupation”, an H-1B might be appropriate. A specialty occupation is one that generally requires at least a Bachelor’s degree in a specific field. In certain cases, equivalent experience may qualify in lieu of a formal degree, however evidence must be submitted to show that the applicant has the equivalent of a US Bachelor’s degree in the prospective employer’s field. Acceptable evidence is an evaluation by a recognized credential evaluation service. Under Immigration regulations, prior to the application for H-1B, the employer must file a Labor Condition Application with the US Department of Labor that certifies that the H- 1B nonimmigrant employee will be paid at least the actual wage level being paid by the em­ployer to all other individuals with similar experience and qualifications for the specific em­ployment or the prevailing wage level for the occupation in the area of employment, whichever is higher; that the employment of H-1B workers will not adversely affect the working condi­tions of workers similarly employed; that there is no strike, lockout, work stoppage or labor dispute in the occupation in which the H-1B worker will be employed; that notice of this appli­cation has been supplied to the bargaining unit, if appropriate, or notice has been posted for 10 consecutive business days. The above four labor condition statements are contained on the LCA form. 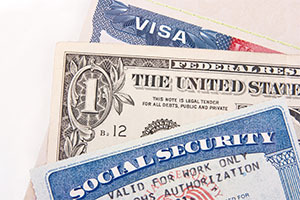 The first requires that you state that H1B nonimmigrants will be paid the actual wage level paid by the employer to all other individuals with similar experience and qualifications for the specific employment in question or the prevailing wage level for the occupation in the area of intended employment, whichever is higher. With respect to employees, when making this statement you need only consider the wage level of other H-1B employees. However, you must also consider the prevailing wage level for the occupation. The employer, when indicat­ing the prevailing wage, must have documentation to support the wage determination. That documentation can be in the form of an independent wage survey conducted by the employer or by a professional organization, or the prevailing wage may be obtained from the local office of the Labor Department. The second requires that you state that the employment of the employee will not ad­versely affect working conditions of workers similarly employed. The third requires that you state that on the date the application is signed there is no strike, lock out or work stoppage. The last confirms that you have followed the notice requirements. Under the notice requirements, prior to the filing of the LCA, you are required to give notice to the bargaining representative of the employees in the occupational classification in which H-1B workers will be employed. If there is no such bargaining representative, you must post notice of the filing of the LCA in at least two conspicuous locations in your facility. The notice shall remain posted for a total of 10 days. The notice shall indicate that H-1B workers are sought; the number of such workers sought; the occupational classification; the wages offered; the period of employment; the locations at which the H-1B workers will be employed in the occupation and that the LCA is available for public inspection at the employer’s principal place of business in the US or at the worksite. The notice shall also include the following statement: “Complaints alleging misrepresentation of material facts in the labor condition application and/or failure to comply with the terms of the labor condition application may be filed with any office of the Wage and Hour Division of the United States Department of Labor.” As an alternative to the notice, you may post an exact copy of the LCA together with the statement regarding filing of complaints. The record keeping requirements are significant. A copy of the labor condition applica­tion must be retained as well as a copy of whatever documentation you used to determine the wage for the occupation. Further, the documentation must include information about the employer’s pay rate to employees in the area of intended employment and in the occupational classification. These records must be retained for one year beyond the period of employment shown on the LCA. The employer has a workforce of 51 or more “full time equivalent” U.S. employees and employs H-1B workers in a number that is at least 15% of the total full-time equivalent workforce. The employer employs between 26-50 full-time equivalent employees in the US and employs more than 12 H-1B workers. The employer employs 25 or fewer full-time equivalent US workers, and employs more than 7 H-1B workers. For dependent employers, the wage attestation above is also considered to include a promise that H1B workers will continue to be paid during times that the employer keeps them “on the bench”, that is employed, but without an assignment. the company has recruited for a U.S. worker to fill the position and has offered the position to any such worker who is as qualified as, or more qualified than, the H1B beneficiary. have attained a Master’s or higher degree or its equivalent in a specialty related to the intended employment. Public access is mandated by the Labor Department regulations. Within one working day after the date of filing with the Labor Department, the public has a right of access to the LCA, the documentation of the wage level and a copy of the posted notice. The employer’s public access file, therefore, should include: a copy of each completed LCA filed, the wage paid the H1(B) workers, the system used to set the actual wage for the occupation, a copy of the documents used to establish the prevailing wage of the H1B occupations, and documents showing compliance with the notice requirement. This folder must be retained for one year beyond the end of the period of employment specified on the LCA. In addition to the public access documentation, the employer must maintain certain payroll records for DOL to review. The DOL requires that the employer retain payroll records of all employees in the occupational classification of the H1B worker from the time the LCA is filed throughout the period of employment. Those payroll records must contain the full name and home address of the employees, their occupation, rate of pay, and hours worked each week as well as overtime earnings each week , total additions and deductions from each pay period and total wages paid for each pay period, date of pay and period covered. The employer must maintain the payroll records for a period of three years from the date of the creation of the records. The prevailing wage is valid for three (3) years during the validity of the H1B Petition. After the LCA is filed, the employer must then file a petition and supporting documen­tation to establish that the position qualifies as a specialty occupation and that the alien has the minimum education and skills for the position. The company must also establish the financial ability to pay the alien the wage offered. The company will have to supply their tax ID number, gross and net annual income, date established and number of employees.